After months of campaigning and endless bickering between proponents and opponents of the bill, Measure D has passed into law with the required supermajority in Santa Cruz County. But what does this comprehensive transportation funding plan mean for the Santa Cruz Branch Line and the Monterey Bay Sanctuary Trail? Quite a lot, actually. Fourteen California counties floated transportation sales tax measures this year in a response to what has become a crisis in funding new construction and maintenance of transportation infrastructure projects. Santa Cruz with Measure D and Monterey with Measure X were two such counties. While many counties focused on maintenance and construction of roads and highways, Santa Cruz opted for an impressive blend of road and highway projects with support for Metro transit, bike and pedestrian trails, and a little—eight percent—for upkeep of the rail corridor and additional studies of transit on the Branch Line. The rail component began at 15%, and it might even have been 20% and been able to fund actual passenger rail service but for the fact that sales tax measures of this type require a supermajority, 66.7% approval, in order to pass. Santa Cruz County civic leaders had the unenviable task of finding a distribution of revenue that would garner public support—not too much for Highway 1, not too much for the Branch Line or rail trail. A plan to dedicate $10 million to build a rail station at Pajaro was axed and more money was put into the Metro bucket in the aftermath of their service cuts. All in all, Measure D was a pretty balanced package, and one of the most alternative transportation-friendly measures ever produced in the state. Hotly contested by one loud, but small local group, the measure passed by 67.46%, with more than 80,000 voters saying yes, more than the required two-thirds required. The votes for Measure X in Monterey County, with similar (though smaller) contributions to transit and trails, has yet to be called and stands at 67.12% approval. The Transportation Agency of Monterey County (TAMC), had the same challenge the Santa Cruz County Regional Transportation Commission (RTC) had in presenting a balanced measure that could pass. Both organizations are partners in regional rail projects, and passage of Measure X is important to the success of local projects in both counties. Measure D is great news for rail transit proponents for more reasons than the meager 8% allocated to the rail corridor. An additional 17% of funds are earmarked for the Monterey Bay Scenic Sanctuary Trail network, which will be expanded beyond the almost eleven miles of parallel track and trail that has already been funded through previous measures. As more of this parallel trail is built, it will become more difficult for anti-rail, trail-only advocates to remove the existing rail infrastructure. When considered together, 25% of Measure D is dedicated to the award-winning rail-and-trail project. Source: Santa Cruz County RTC, “Measure D: 2016 Transportation Improvement Plan" <http://sccrtc.org/funding-planning/2016transportationballotmeasure> 27 November 2016. Measure D funds additional studies necessary to pursue eventual rail transit, including environmental and economic analyses, and without this funding the project would be at full stop. The newly-commissioned Unified Corridors Investment Study will look at investments that can be made to the highway, Soquel Avenue and Soquel Drive, and the rail corridor in an integrated and sustainable manner. A request for proposals has been issued and a consultant will be selected to help develop four investment “themes” that the RTC will provide for evaluation. The consultant will score transportation investment proposals using performance metrics based on the Sustainable Transportation Analysis and Rating System (STARS) that shaped the goals and policies of the long-range Regional Transportation Plan. STARS ensures that economic, environmental, and equity needs are met in a balanced way. Rail transit serves this goal very well and there is good reason to be optimistic about the future of the Branch Line. This coming year, look for updates from the RTC and attend hearings and stay current by signing up for updates at: http://sccrtc.org/about/esubscriptions. Barry Scott is an Aptos resident and the California state program director for the National Energy Education Development Project (NEED). That is what Professor Sandy Lydon told me over a decade ago when I asked him for help in finding the “lost tunnels” of the South Pacific Coast Railroad. In those days, there were very few websites that even mentioned the tunnels. There was no Google Maps. Exploring and finding the old right-of-way was a lot more work in those days, but that just made finding it that much more meaningful. Today, with two kids and a busy law practice, I really appreciate having websites that help me find just about any railroad site on the first try with my iPhone’s map app, but there’s something to be said for trying so many trails to find a tunnel portal that you begin dreaming about it at night. First, start at the local library. All the answers you seek are there. That is still good advice for just about any research project. I wasted many weekends of hiking in the wrong place when a look through books on the local railroads would have pointed me in the right direction. Another piece of advice: go now. If you wait a year, it may be gone. In the 1990s, I had no interest in exploring railroads. That is too bad because, in just a few short years, we lost both the Northwest Pacific Railroad, with its incredible series of tunnels and trestles, and then the vast, historic Norden complex near Donner Pass. A lot of short-line railroads have gone under in the same time period and are now lost forever. The Northwest Pacific could have kept a railroad explorer in business for years, with miles of gorgeous redwood-lined track. In the decade since its closure, the right-of-way has become so overgrown as to be largely impassable to all but the most dedicated. I am still hoping to visit Island Mountain (Google it), but it will have to be by helicopter. So, if you learn of something that interests you, don’t wait: go now! Lastly, be safe and sensible. I should tell you to always take another person with you, but, the truth is, walking abandoned railroads is my “me” time. Still, railroad exploration means going into remote areas where dangerous conditions should be expected. At least tell someone where you are going and draw them a map if you can. Tell them to call law enforcement if you aren’t back by a given time. If you are confronted by property owners or railroad police, apologize profusely and leave. It is not about avoiding arrest. It is more about not making people so frustrated and angry that they put up fences and gates to keep out the rest of us. I have always been pleasantly shocked at how accommodating railroad crews are if you are polite and simply indicate that you want to photograph the line. Be nice. Warning: The Santa Cruz Branch Line is a live rail line and not abandoned. For your safety, please do not trespass on the rail line. Violators may be prosecuted. 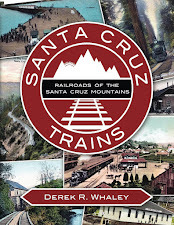 It has been nearly two years since Santa Cruz Trains: Railroads of the Santa Cruz Mountains first released, and sales have remained steady and interest in the book and the history of Santa Cruz County railroading is strong than ever before. Thus, it is unsurprising that author and historian Derek R. Whaley has found time to release a short companion book to his historical tome. 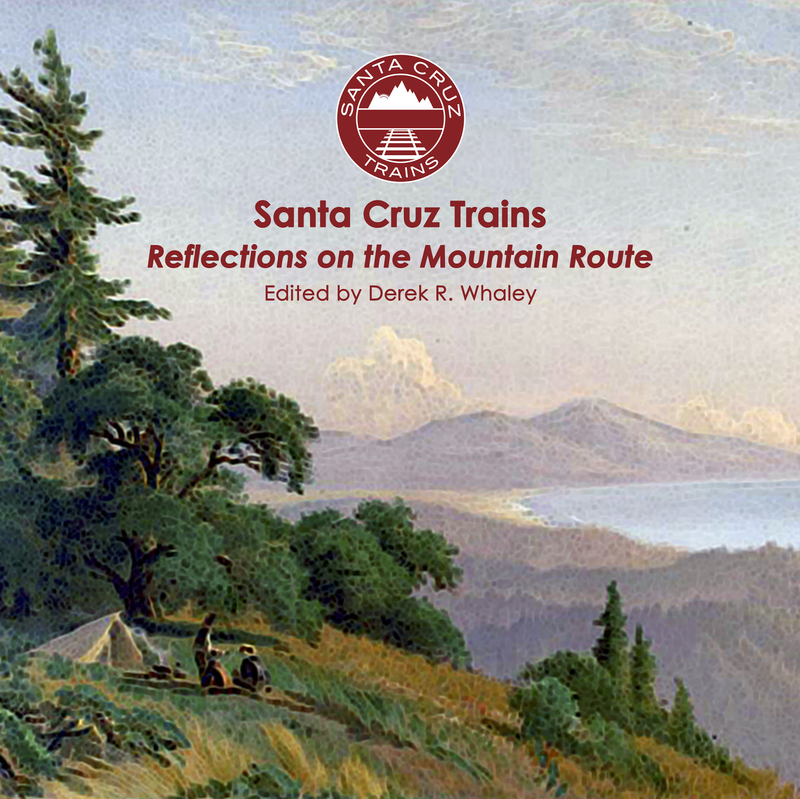 Entitled Santa Cruz Trains: Reflections on the Mountain Route, this 64-page coffee table book features 30 rare and unpublished photographs and postcards of sights and scenes associated with the Southern Pacific Railroad's former route through the Santa Cruz Mountains. Accompanying these photographs are 31 quotations from local newspapers, railroad magazines, contemporary books, and famous authors of the nineteenth century proclaiming the wonders and visual splendor of the once-famous route through the redwoods. This is a collection of photographs and quotes that will make one smile and reflect fondly on what was once perceived as a modern marvel and one of the most beautiful railroad routes in the world. Santa Cruz Trains: Reflections on the Mountain Route is available now Create Space.com for $12.99. It will be available on Amazon in mid-December. 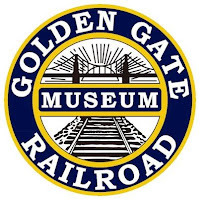 As the date of the election approached, the Santa Cruz County Regional Transportation Commission (RTC) decided to delay a final decision on the relocation of the Golden Gate Railroad Museum that was proposed over a year ago by the organization. Since the election, however, the first two meetings of the RTC have been cancelled leaving the museum move in doubt. Currently, the museum rolling stock is being stored at Niles Canyon awaiting transfer to a new venue. If you wish for the museum to move to Santa Cruz, let the RTC know by emailing info@sccrtc.org. In what is becoming a rather common event in Santa Cruz County, Watsonville lawyer Brian Liddicoat recently gave a free talk at Loma Prieta School entitled "Trains and Lumbering in the Santa Cruz Mountains, 1800s". Held on October 20, this event was sponsored by the Loma Prieta Museum and the Loma Prieta Community Foundation. 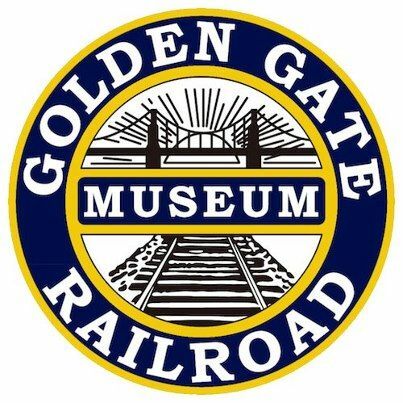 Liddicoat has discussed local railroad history throughout the Bay Area since 2009. He has given twenty presentations on the various aspects of the local railroads and the industries that utilized them. If you are interested in having Liddicoat speak at an event, contact him at (831) 594-4418. At the October 6th meeting of the RTC, a proposal to replace the current tracks along the Santa Cruz Branch Line with a guided bus system was proposed by Stanley Sokolow, who included in his proposal many photographs and links to successful guided bus operations. Sokolow’s primary argument is that, although a light rail train can carry more passengers than a bus, such a system is unsuitable for Santa Cruz County due to its restricted population size and the range of the right-of-way. He notes the flexibility of the system compared to trains, since the buses can go off the track when needed, and he recommends the local government look at cities like Eugene and Springfield, Oregon, which have recently adopted such a system. Implementation of this proposal would replace the current Santa Cruz Branch Line tracks. On September 28, Ian Applegate and his coworker, Jason Bunter, were working on the Santa Cruz Big Trees & Pacific Railroad in the morning when they smelled smoke in the woods nearby. They were doing right-of-way maintenance near the Garden of Eden footpath just south of the San Lorenzo River truss bridge and an illegal campfire has broken out of its pit and was beginning to spread to the surrounding trees. Although the fire was only about five feet in diameter when they called 911, it had grown to roughly sixty feet by the time they hung up. The only reason it was contained was because they happened to be working in the area. This was the third of three small fires that broke out along the right-of-way last summer. 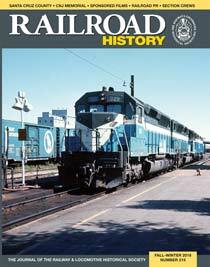 Derek R. Whaley recently published an article entitled "The End of the Line: The Abandonment of Passenger Services in Santa Cruz County, California" in Railroad History (No. 215 Fall-Winter 2016). The article documents when the various rail services were set up in Santa Cruz County and then discusses the reasons why the passenger service industry collapsed in the county between 1930 and 1959. The article is supplemented with nearly two dozen photographs, many of which have never been published before. Whaley has been working on this article since 2014. Single copies of the issue can be purchased for $15 at http://rlhs.org/Publications/History/rrhback.shtml. Continuous – Brian Bergtold and Howard Cohen have been sharing videos and photographs of the Santa Cruz Branch Line in action. In addition, Tom Clark, Bill Dawkins, Ralph Parks, Dale Phelps, Craig Polson, Lisa Robinson, and Derek Whaley have all posted wonderful historical photographs of the local lines. Sept. 3 – Dawkins shared some information on the Nestldown miniature railroad, which operates at a private wedding venue on Old Santa Cruz Highway. Sept. 4 – Ian Applegate posted photos of the Roaring Camp Beach Train relocating to the San Lorenzo River bridge to allow EMT access at the Boardwalk on Labor Day. Sept. 22 – Phelps reposted an enlightening article about Alma originally posted on the San Jose History page. Oct. 1 – Dawkins posted a lovely newspaper article from 1875 announcing the opening of the Felton & Santa Cruz Railroad. Oct. 2 – Bergtold posted a video showing all four Roaring Camp steam locomotives operating during the Harvest Faire & Steam Festival. Oct. 3 – Polson discovered two original South Pacific Coast Railroad passes for sale on eBay. Original South Pacific Coast Railroad ride pass from 1887, the last year the railroad ran independently of Southern Pacific. Oct. 10 – Janie Soto shared an intriguing Watsonville Register-Pajaronian article from 1995 discussing plans to restore passenger rail service to Santa Cruz County. Oct. 16 – Whaley reposted Bruce Sawhill's letter to the Santa Cruz Sentinel extolling the virtues of restoring the Santa Cruz branch line to full service. Whaley also shared a source for free railroad journals on the web. Nov. 3 – Trevor Park shared a video from his Treefrogflag Productions studio of the Roaring Camp trains during the Harvest Faire & Steam Festival. Nov. 9 – Karl Rowley posted troubling news that Brian Peoples of "Trail Now!" has been spreading false propaganda about the fiscal and environmental costs of a restored Santa Cruz branch line. Nov. 10 – Cohen posted a photograph showing repairs to a washout at La Selva Beach, as well as evidence of track repairs and upgrades in preparation for the Polar Express excursion train. Nov. 12 – Bergtold posted a video of the Santa Cruz Lumber Company railroad operation on Pescadero Creek from 1953. Nov. 18 – Gil Pennington revealed some excellent local stereoscopic images he found on ebay. Nov. 20 – James Davey posted a video of a derailment at Aromas in November 2003. Nov. 21 – Thomas Rivette expressed concern regarding the status of the railroad bridges on the Santa Cruz branch line. The answer can be found here. Cohen also reported that the Polar Express's gallery cars arrived, allowing the excursions to go forward. Nov. 22-23 – Cohen showed photographs of a SC&MB locomotive leading repair work on the branch line. SEPT. 9 – Aeneas Sardine Products Co.
SEPT. 16 – American Can Co.
SEPT. 30 – Monterey Canning Co.
OCT. 14 – San Xavier Fish Packing Co.
OCT. 21 – Hovden Food Products Corp.
OCT. 28 – Enterprise Packing Co.
NOV. 4 – F.E. Booth and Edgewater Packing Co.
NOV. 18 – Del Mar Canning Co.
NOV. 25 – Pacific Fish Co. & California Packing Corp.
View decorated Christmas trees atop Bear Mountain! Roundtrip from the Santa Cruz Beach Boardwalk.